A rapid response to changes in the environment is key to the successful survival of a population or species in the currently changing climate. The accepted paradigm that adaptation facilitates survival in changing environments has been established by studying animals during later life stages at the diploid level. We intend to increase the resolution of current selection models, studying the effect of gametic variation on fitness later in life. Recent findings in our lab showed that sperm in the ejaculate of a male vary in their longevity and longer-lived sperm within the ejaculate sire fitter offspring. Furthermore, we demonstrated that these phenotypes are a characteristic of the underlying genetic variation within the gametes themselves. 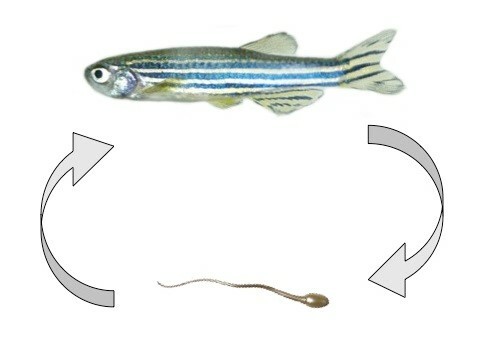 Given these exciting findings it is now our aim to establish how selection on sperm traits and genomes within an ejaculate compares to selection on the diploid juvenile and adult fish and whether gametic selection can contribute to a rapid adaptive response to changing environments. The successful applicant will expand on our recent findings, studying how climatic variation affects sperm and the resulting offspring in the zebrafish model. Given the changing climate this will be highly relevant not only to externally fertilising organisms such as fish and amphibians, but also to insects, birds and mammals. Sperm from different environments will be used for in vitro fertilisation and downstream single-cell sequencing. These studies will be carried out in a brand new, state-of-the-art zebrafish facility at the UEA School of Biological Sciences and at the Earlham Institute, giving the opportunity to gain experience in both wet and dry labs. Apart from participating in the excellent ARIES DTP Core Training Programme, you will acquire training and hands-on experience in Experimental Design, Next Generation Sequencing and Bioinformatics, all great prerequisites for future employment. You will take part in lab and departmental seminars and journal cubs and participate in national and international meetings and conferences to present yourself and your results.